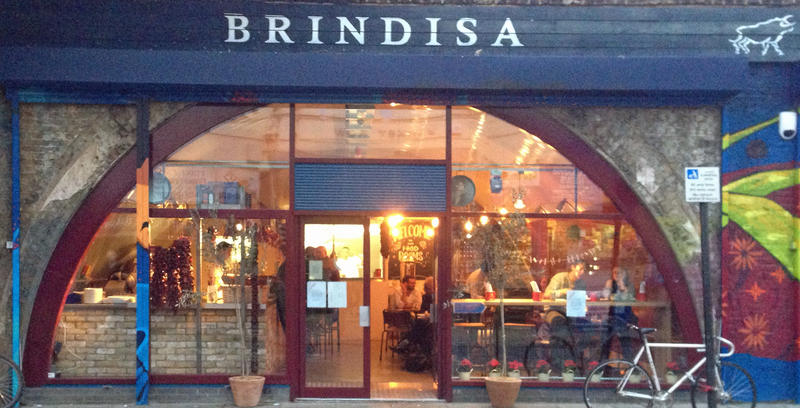 Returning from our too brief visit to Spain we decided to compare our restaurant experiences in Andalucia with the Brindisa Food Rooms in Brixton. Located next to their shop on Atlantic Road, the design takes in the railway arches and has used brick and steel in a (I hate this word) minimalist interior. Metal chairs and tables for two are pushed into different formations depending on the size of the party – with three we had plenty of space on two tables but four would be a bit squashed if they didn’t time the dishes well. The menu is ….”inspired by the Catalan Llesqueries” (from the website) but toast and salad to you and me. We wrote about their cheese sandwiches in a previous blog. We thought they were so delicious we ordered another one on this occasion. The waiter comes to the table to explain everything but you have to order at the counter and either pay straight away or leave a card. Presumably this keeps out all those who may try to make a quick getaway while no-one is looking. The menu has tiny starters of olives, salted almonds and small dips (tapenade etc) to accompany a glass of wine and larger plates like salads, different llesquerias and inevitably charcuterie – serrano, salchichon and iberico ham. They also have a few daily specials. We chose the cheese on toast, the iberico selection, tapenade, gazpacho (a daily special) and for dessert a slice of almond cake with saffron yoghurt to share. We say no more about the cheese on toast ……. it was still delicious. The meat selection came with four different meats and was definitely enough for three carnivores. The variety also added to the interest with wafer thin slices of pork loin, chorizo, salami but thicker pieces of iberico. The tapenade was served with thin fingers of hard baked bread which were actually difficult to break apart. We expected the tapenade to be salty but you really do need to like salt to eat this. 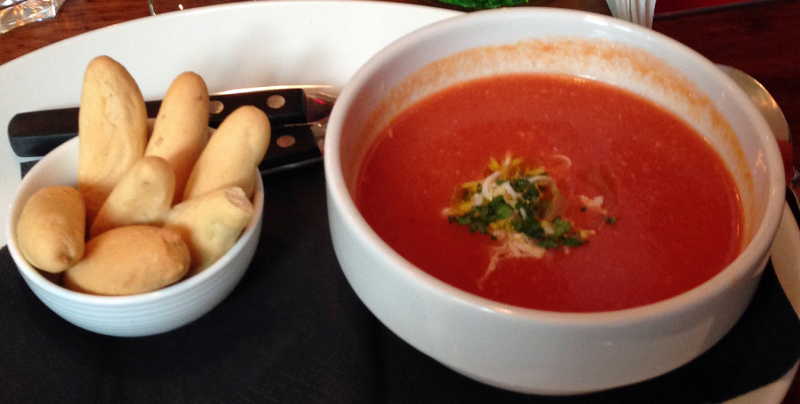 The Gazpacho was very light and had more red pepper than usual – it doesn’t deserve a superlative but it was definitely good. 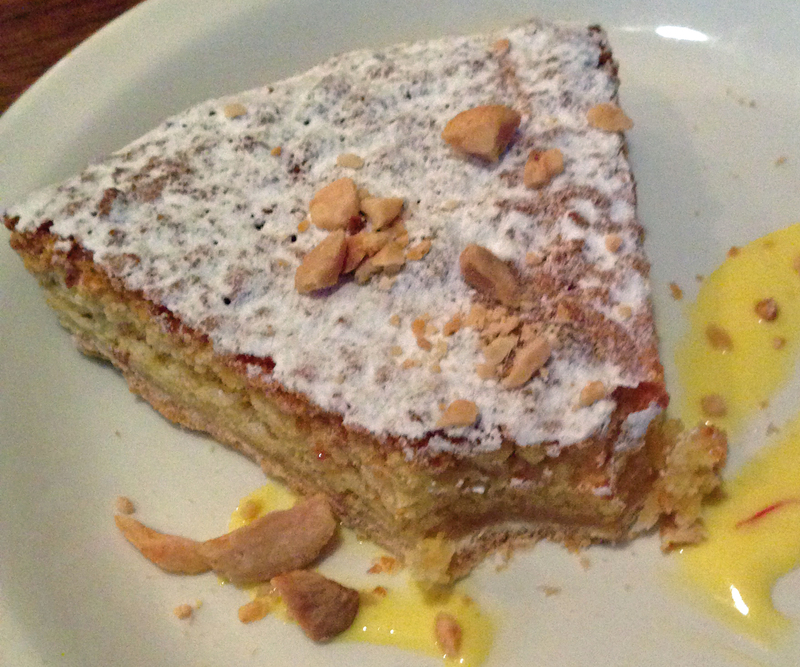 We wanted more of the saffron yoghurt sauce for the almond slice. We also ordered two glasses of red wine – go for the more expensive one for a better richer flavour. The service was excellent – plenty of explanations. We did find a price discrepancy between the menu and the till receipt but they willingly paid back the difference as clearly they had not updated the menu. The whole thing came to an eye-popping £46.60 but we knew it wasn’t going to be cheap and half was the meat selection. We had had a good meal with well chosen ingredients in a pleasant ambiance where we could hold a steady conversation without getting a sore throat …. how old foggie is that…… If you want a cheap tapas then go to Seven – here is a bit more sophisticated and you can linger.